I bought the most expensive yarn ever! It wasn’t the most expensive in the shop but it certainly was the most expensive I have ever bought! It happened on my recent trip to New York. Let me explain. I just made my husband walk 20 blocks (if you ask him he will tell you it was 40), and those who know New York, know that 20 blocks = 1 mile (1.6km), to a yarn shop called String on East 33rd Street. I have been to this shop before and knew that it’s a small little shop on the first floor. As we arrived outside the shop I spotted this little coffee shop and I told my husband he should have a coffee while I go upstairs to the yarn shop. I could see on his face he was not happy with this plan. Once I was upstairs and in the shop I asked the shop assistant to show me the cashmere yarns. I asked how much for a ball, her reply was not good, $50 for a 50g ball! As I wanted to knit a scarf and needed 6 balls, I quickly explained that this was far too expensive for me! Now here comes the expensive purchase, I have just made my husband walk 20 blocks to a yarn shop and told him that he could not come up to the yarn shop (I didn’t really say that but that what he heard when I told him to have a coffee!) So now you understand I can’t walk out of this shop with no purchase! 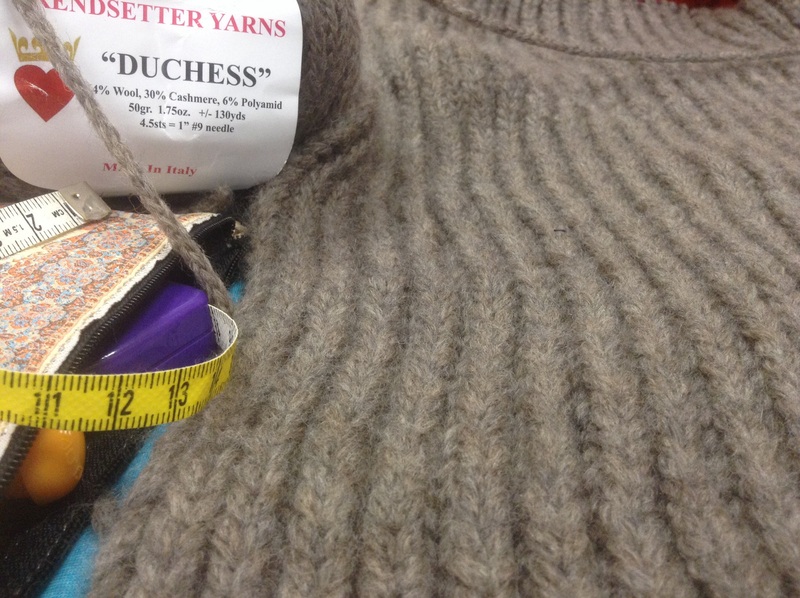 So I asked for a cheaper option, this ended up being a yarn called “Duchess” by Trendsetter Yarns, 6 balls of 50g at $25 a ball! Well, my thinking was, “My husband is already upset with me, if I come out with no purchase he is going to be more upset”. So this is easy, just buy some yarn! I just finished knitting the scarf, after knitting a few test patterns, I decided on a fisherman’s rib pattern, casting on 50 stitches on size 10 (6mm) circular needles, the scarf ended up being 11” (28cm) x 63” (1.6m). No left overs! Happy crafting till next week! This entry was posted in Craft sewing, Knitting and tagged buzy day, crafts, knitting, NikkiM. Bookmark the permalink. I loved that story. Can picture the look on Len’s face – priceless. 🙂 I hope that scarf will be for your poor husband! Or maybe some socks would have been better, his feet might still be hurting from this trip. I am however very impressed that he was disappointed that he was not “allowed” to come to the yarn shop. Mine would be pleased if he could have a drink instead and stare at the latest football results instead. I really enjoyed knitting with it! My problem is my husband enjoys craft shopping more than I do! Hehe! We have to love them! I get the sulky wait-by-the-door-like-a-bouncer from hubby when I do any shopping! For sure…leave no leftovers or reminders that you bought the yarn and didn’t use it all!!! So was your husband pleased with the $150 purchase? Mine would’ve been through the roof – LOL! You too kind! Thanks for your lovely comment! Your logic makes perfect sense to me! My husband would be more than happy to be left in a coffee shop. Isn’t that what coffee shops are for?! I love the way he thinks! He is a keeper! Hehe! Ah, the siren call of yarn. I have heard that song many times. If it only ended badly now and again, I could stop l listening. But all the times it’s worked out just feed me to keep doing it.